Garrett Neese/Daily Mining Gazette Houghton Code Enforcement Officer Jeff Jepsen pushes in sand for MacNeill. 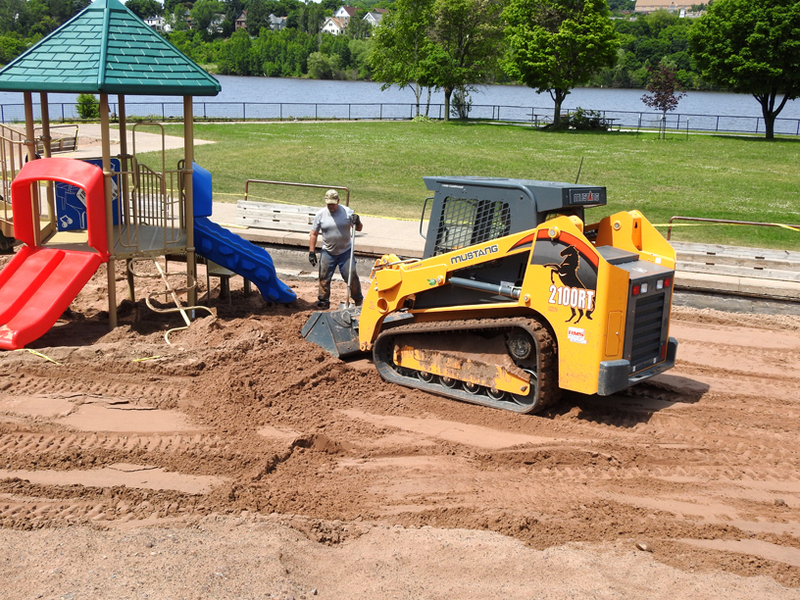 HOUGHTON — The afternoon after a June 17 flash flood incapacitated the Kestner Waterfront Park, Warren MacNeill already saw children playing on playground equipment. Or even more. With assistance from city crews, the Harrisville, Michigan, resident spent most of last week helping restore the beach. MacNeill was in the area helping with preparations for the wedding of his daughter, Megan Yeoman, a 10-year resident of Houghton who came to the area to attend graduate school at Michigan Technological University. The people of the Copper Country have treated her well, which was another factor in his action, MacNeill said. “I’m calling this a wedding present,” he said. The city of Houghton brought several truckloads of sand as well as a equipment, said RV Park supervisor Dan Kemp. MacNeill worked at the park for a couple of days using local equipment. But on Wednesday, he drove back to Harrisville — 410 miles away — to retrieve his tractor. He returned Thursday, working until 10 p.m., until it got too dark. On Friday afternoon, he was back at it, filling in sand with a shovel around one of the play structures. Jeff Jepsen, code enforcement officer for Houghton, was pushing sand with a skid steer. Thanks in part to MacNeill’s help, the beach should be ready for the Fourth of July weekend, even if the water quality of Portage Lake has not been declared safe yet, Jepsen said. “The amount of people I’ve seen — not only Warren, but from West Virginia, Tennessee, or Huron (Michigan) — it’s been unbelievable. People (are) taking family vacations, bringing their kids up, helping,” he said. MacNeill was just as impressed with the local response. A retired Department of Natural Resources conservation officer, he was part of the response for Hurricane Katrina in 2005. “If the people that ran this disaster ran Katrina, Katrina wouldn’t have been a goat rodeo,” he said.